Amazingly, despite being….older, I’ve not read either of these until just recently. 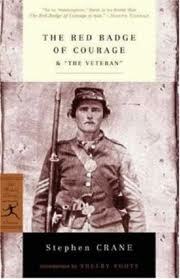 Crane’s depiction of battle, especially his use of analogy inspired me : “The guns squatted in a row like savage chiefs. They argued with abrupt violence. It was a grim pow-wow. Their busy servants ran hither and thither.” Does anybody write like this anymore? Although the story is short, it takes its reader on a roller coaster ride of emotions from the absolute disgust of cowardice to the brilliance of bravery and heroics, all within the same character. Crane’s ability to pack a wallop of a read in such a short amount of pages left me reeling. His raw narrative of battle puts the atrocities of war in the forefront of the reader’s mind and one can’t help but wonder at the madness of our propensity to engage in such an act. 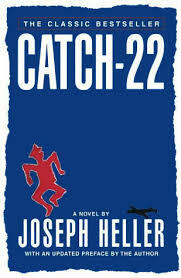 Heller, on the other hand, comprehends the madness of war and translates its insanity without shame in Catch 22. Colorful, bigger than life characters learn to cope with war in not so sane ways because, well, war is not a sane activity we humans partake in. Heller’s complete abandon to the mind and soul of his distraught characters is a great inspiration to this writer…let not our imagination limit us in any way…. This entry was posted on Thursday, January 16th, 2014 at 14:27	and tagged with book reviews, catch 22, good books, joseph heller, kurt vonnegut, reading, red badge of courage, stephen crane, war books, war novels, writer's life, writing and posted in books, history, humanism, Uncategorized, writing. You can follow any responses to this entry through the RSS 2.0 feed.